Federal officials issued new rules for mortgage servicers Thursday aimed at protecting homeowners facing foreclosure. But consumer groups say the rules don't do enough to help prevent borrowers from unnecessarily losing their homes. Since the housing crisis began, many mortgage servicers -- which collect payments for the owner of the loan and handle things like loan modifications and foreclosures -- have been ill equipped to handle the flood of delinquent loans, the Consumer Financial Protection Bureau said. "In too many cases, it has led to unnecessary foreclosures," said CFPB director Richard Cordray. "Our rules ensure fair treatment for all borrowers and establish strong protections for those struggling to save their homes." Among the new rules are restrictions that prohibit servicers from foreclosing on borrowers who are seeking loan modifications and rules that require them to explore all alternatives to foreclosure. 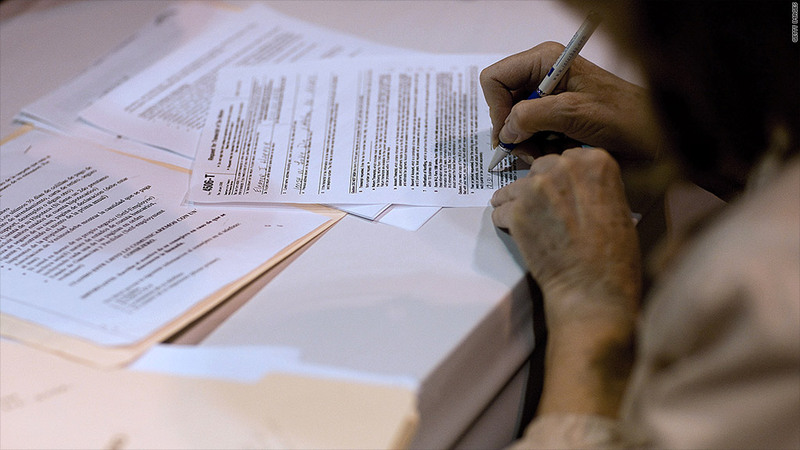 There are also guidelines for issuing clear, straightforward mortgage statements. Yet, consumer advocates say the new rules don't go far enough. "While the establishment of industry-wide standards is important, the failure to require meaningful loan modification protections is a retreat from current safeguards under the soon-to-expire HAMP loan modification program," the consumer rights organization said. Requiring servicers to lower rates on loans or postpone payments would help prevent qualified borrowers from being unnecessarily foreclosed on, the organization said. Restrictions on foreclosure proceedings while borrower seeks a mortgage modification: Referred to as "dual-tracking," servicers will no longer be able to start foreclosure proceedings on borrowers while they are actively seeking a loan modification or other alternative to foreclosure. To give borrowers time to apply for a modification, servicers cannot file the first foreclosure notice until the borrower falls at least 120 days behind on payments. No foreclosure sales until alternatives are considered: If a borrower applies for a loan modification at least 37 days before their foreclosure auction is scheduled, the servicer must consider and respond to the request. They also must give the borrower enough time to accept an alternative to foreclosure before proceeding with the sale. While the 37-day rule provides additional protections to borrowers in judicial foreclosure states, where courts review foreclosure cases, it does little to help those who live in non-judicial states, said Alys Cohen, a staff attorney with the National Consumer Law Center. Many homeowners in non-judicial states, like California and Arizona, won't know the sale date until it's too late since sales in these states are often scheduled with less than 37 days' notice. "[T]he rules give servicers an opportunity to manipulate the system," said Cohen. Consumer advocates also say the rules do not allow for appeals of a loan modification review when they are submitted within 90 days of a foreclosure sale. "If the data is wrong, the borrower is just out of luck," said Mike Calhoun, president of the Center for Responsible Lending. Consider all foreclosure alternatives: After a borrower has missed two consecutive payments, the servicer must send a written notice with examples of alternatives to foreclosure the borrower can pursue. In addition, servicers must consider all available foreclosure alternatives as opposed to the ones that are just financially favorable to the servicer. These options may range from deferred payments to loan modifications. Provide direct access to help: Servicers will be required to provide borrowers with easy access to employees who are dedicated and empowered to help them. Publish clear mortgage statements: Servicers will have to break down mortgage payments by principal, interest, fees, and escrow (to pay property taxes and insurance premiums) and include the amount and due date of the next payment, recent transactions and alerts about fees. Offer early warnings on rate hikes: For most adjustable-rate mortgages, servicers must notify borrowers about upcoming interest rate changes that will affect their payments. If the new payment is unaffordable, servicers must provide information about alternatives and counseling. Avoid overpriced "force-placed" insurance: Mortgage borrowers are nearly always required to insure their homes but if they don't have coverage, their servicers can buy insurance for them and charge the premiums to the borrower. This "force-placed" insurance can be very expensive and the CFPB would require servicers to give advance notice and pricing information before putting clients into this coverage. If servicers buy the insurance but receive evidence that it was not needed, they must terminate it within 15 days and refund the premiums. Credit payments and correct errors quickly: Servicers must credit a consumer's account on the date a payment arrives. They will also have 7 business days to respond to written requests from borrowers to pay off the balances of their mortgages. Also, within 30 days, servicers must conduct an investigation and either correct an error or dispute it. Maintain accurate, accessible documents and information: Servicers must store borrowers' information in a way that allows it to be easily accessible. They must also have policies and procedures in place to ensure that they can provide timely and accurate information to borrowers, investors, and in any foreclosure proceeding, the courts.